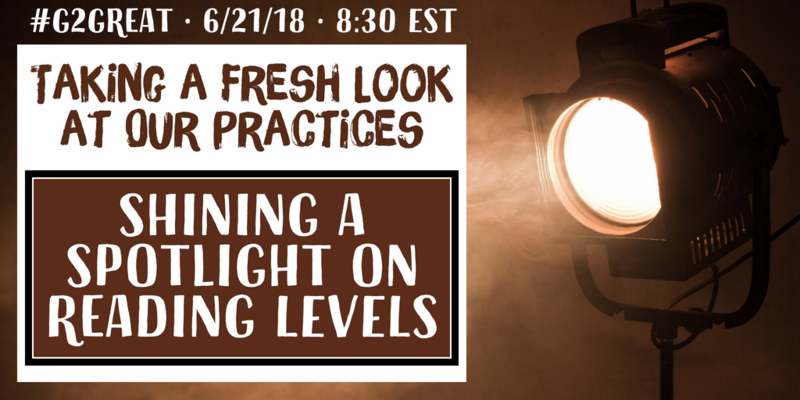 On June 14, 2018, #G2Great launched a four-part series titled Taking a Fresh Look at Our Practices. 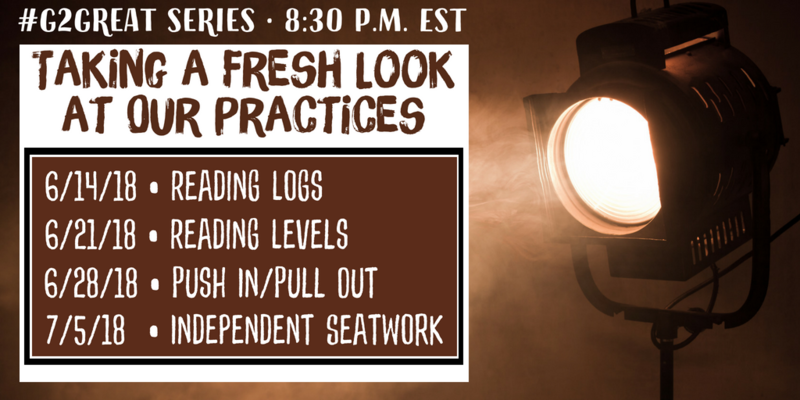 After pondering the implications of reading logs in our first chat in the series, we turned our attention to Shining a Spotlight on Reading Levels on June 21, 2018. We anticipated a spirited discussion for this important topic – and we were certainly not disappointed. In fact Brent Gilson eagerly shared his reflections in a Pre-Chat post called Leveling Up. 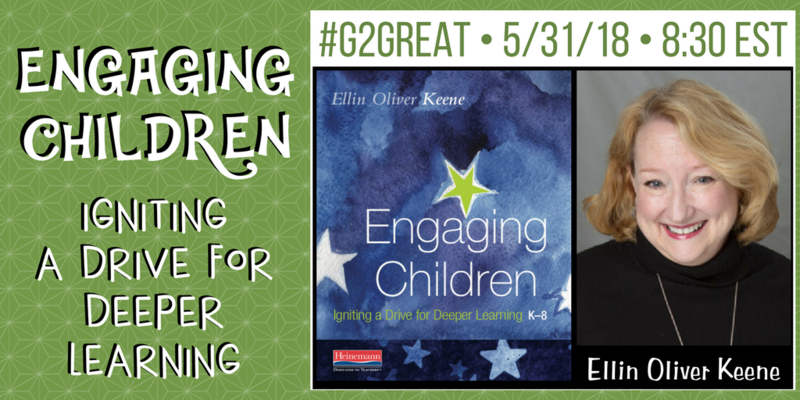 Your #G2Great co-moderators, Fran, Jenn, Amy and I, carefully chose these four topics as we believe that deeper discussion regarding their purpose is necessary to re-examine how they are being addressed in practice. Quite honestly, I have seen each of these topics morph into a shallow act of thoughtless DOING, thus slowly transitioning away from the intentional research-based decision-making process that keeps children at the center of all we do. Our commitment to renew this culture of instructional responsiveness is based on our deep belief that the best interests of students is the perpetual driving force of our choices. Regie Routman illustrated the critical role of instructional responsiveness almost a week before our chat when she responded to my question, “How do you feel about reading levels?” Regie implored us to set our sights squarely on helping students “become comprehending, self-directed, joyful readers.” Her reminder is essential considering that the way that reading levels have been misconstrued in recent years is in direct conflict with this lofty goal. Whether we are willing to view reading levels in more professionally responsible ways or we opt instead to blatantly misrepresent the intent of these tools can make or break our ability to achieve Regie’s words of wisdom. 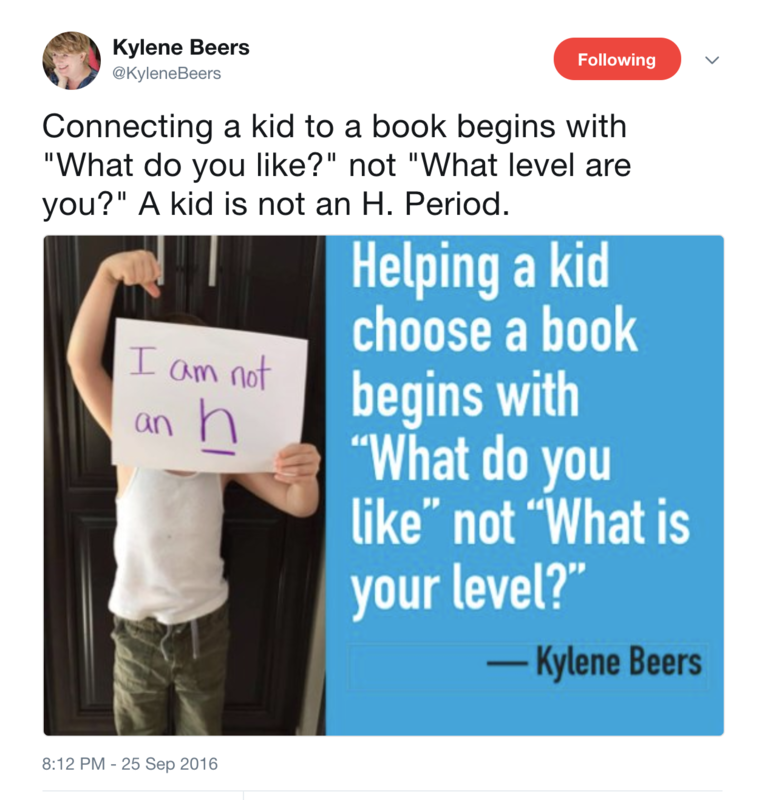 The disconcerting misrepresentation of reading levels I have observed has not gone unnoticed by literacy experts Fountas and Pinnell here, here, here and Kylene Beers “A Kid is Not an H.” Believing that we have a responsibility to this profession to lift up our voices, I’d like to use my post as a forum to add my voice to this conversation. 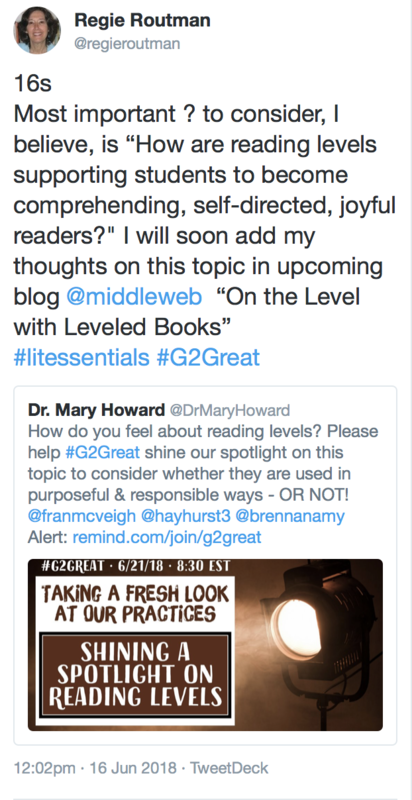 Our #G2Great family drew the reading level line in the proverbial professional sand, so I’ll add selected tweets after my reflection. Judging by our chat dialogue, there is widespread agreement that we can and should re-envision reading levels in order to approach them in more responsible student-centered ways. Perhaps the best place to begin is to look back on my own entry point to the view of reading levels I still hold dear. In 1990 I began a life-altering phase of my professional training when I became a Reading Recovery teacher. One component of the powerful thirty-minute lesson design is taking a running record on the book the child read the previous day. The resulting information supported our thoughtful selection of next step texts across a gradually increasing gradient of difficulty. This flexible process allowed us to linger on the edge of each child’s growing understandings of the reading process at that moment in time to both strengthen and stretch those understandings. It is important to emphasize that the reading levels we gleaned from running records in Reading Recovery were not used to label children and were never reported to parents or students. Rather, we used them as one instructional tool of many that helped us to understand and support learners. We knew we could only make the best decisions if we merged all we knew about the child in a combined body of knowledge. We recognized the potential and limitations of reading levels, aware that it is an imperfect science and that the analysis of the reading process in action was more relevant than numerical values. In other words, reading levels guided our text selection, but it was our deeper knowledge coupled with our unwavering commitment to the needs and interests of children that informed these decisions and drove our choices. We understood that levels simply do not work in isolation of these bigger picture ponderings. Fast forward to 2018 and the thoughtful flexibility and broader intent of reading levels that I learned in Reading Recovery is in stark contrast to the way they are viewed in many schools. We have lost our collective minds of reason when we assign reading levels like a badge of honor or dishonor that tethers children to a leveled bin and relegates them to intervention groups with little hope of escape from either. Worse, classroom leveling charts are not uncommon as children are visibly reduced to numbers in a dreadful public display that decries professional ethics and has serious legal implications. It seems apparent that the way reading levels are viewed in Reading Recovery and how this role is playing out in too many schools reflects our professional disarray on this topic. 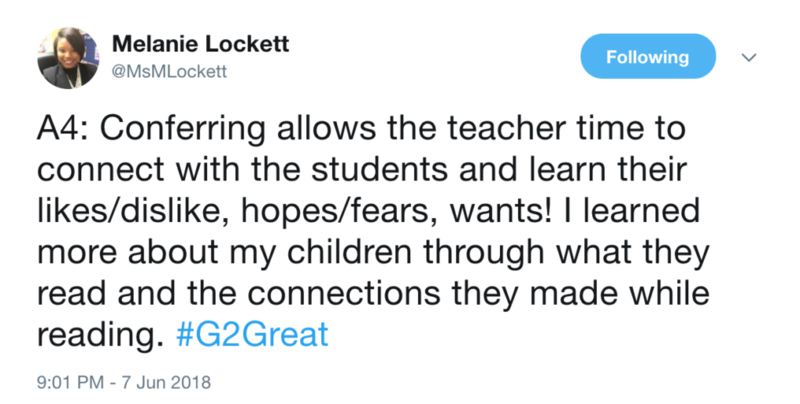 Having spent years of my life studying the work of Marie Clay, I can say with absolute certainty that she would be horrified by this lockstep approach that feels more akin to a level-assigning frenzy than flexibly using an instructional tool to support rather than dictate the decisions we make thoughtfully in the name of children. Sadly, reading levels are only the tip of the defective assessment iceberg since Accelerated Reader scores and varied data points continue to mount into a level of numerical insanity at a record high. So, what is the tipping point between the way reading levels are approached in Reading Recovery and the flip side of that view that is harming children? There is no question in my mind that the tipping point is professional wisdom that feeds our inner voice of reason. As a Reading Recovery teacher, we were not mandated to take running records so that we could compliantly record reading levels. We knew why we were doing what we were doing and we understood exactly how this information did and did not inform our instructional efforts. Carrying our knowledge in our back pockets each step of the way allowed us to use reading levels in professionally responsible ways and always with the success of our learners in sight like a dangling visual carrot. Therein lies the problem my friends. When we do not understand why we do what we do, it is impossible to do it in ways that are meaningful, purposeful and yes responsible! 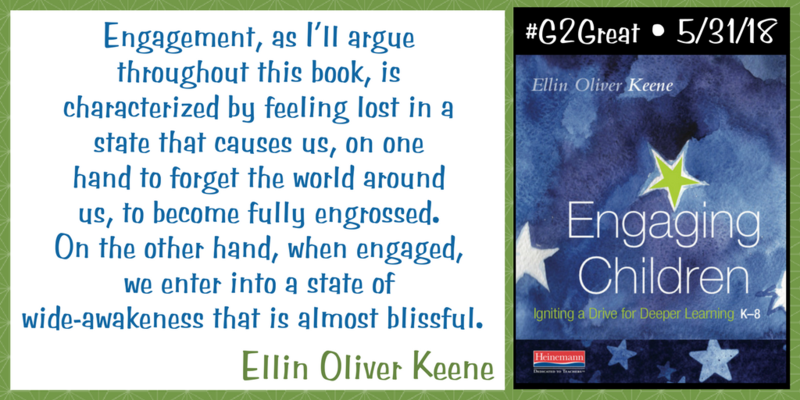 Too often, teachers blindly gather reading levels without the benefit of the thinking that would maximize their use and support our understanding of children. Professional wisdom is the fuel that allows us to bring our best selves to the learning table day after day. 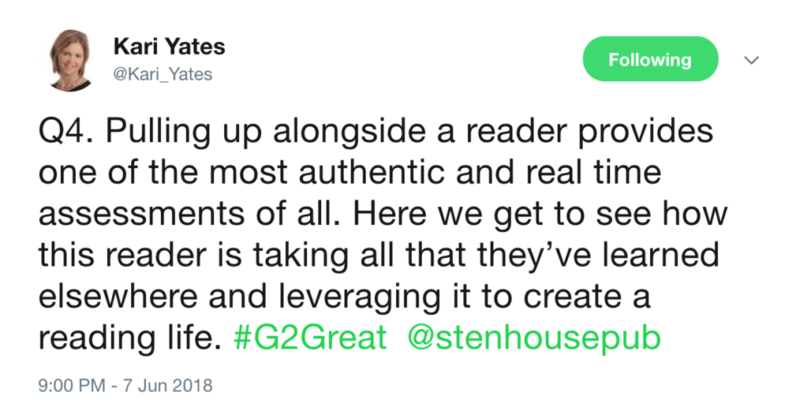 Too many teachers are struggling to address reading levels in instructionally responsive ways because we have unwittingly created a reading level culture of DOERS and in the process thwarted our efforts to use those reading levels within a culture of THINKERS. Reading levels are the WHAT but we are doomed to fail without WHY and HOW. Reading levels offer a flexible tool for instructional text selection but they are grossly inadequate when used in a vacuum. If their purpose and potential to inform is misunderstood, we will inevitably justify labels that assign children to leveled bins and unnecessary or ineffective interventions or subject them to impersonal charts that visibly create haves and have nots. We merely mindlessly reach for a text attached to a level until we first reach deep within to embrace our own knowledge of literacy and the reader in front of us. Regie reminds us that there is a difference between instructional levels and instructional needs. (220) Without a laser-like focus on instructional needs then instructional levels become less flexible and more definitive in nature. As a result, reading levels will be as meaningless as numerical spreadsheets thoughtlessly peppered with empty level references that have lost the immense beauty of the incredible child beneath it all. And that would be the most tragic reading level outcome of all!